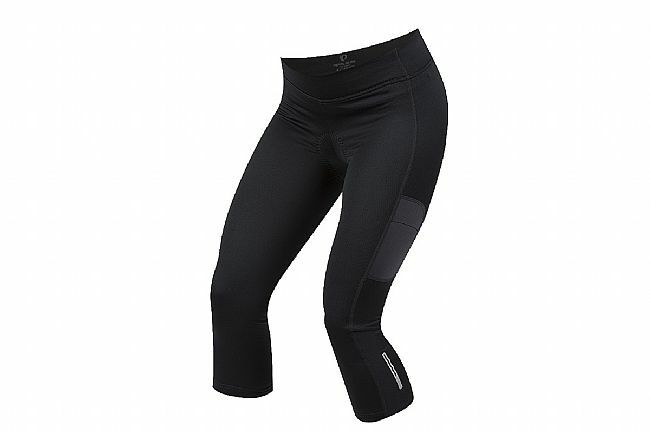 The Pearl Izumi Women's Sugar Thermal Cycling 3/4 Tight is designed for comfortable riding in cool weather. With SELECT Thermal Fabric, these 3/4-length tights provide fleece-lined warmth and soft comfort against the skin that extends below the knees. Featuring Pearl's 6-panel anatomic design, the Sugar Thermal offers an excellent fit catering to the riding position, while the wide flattering waistband eliminates abdominal pressure. For optimal riding comfort, the women's specific SELECT Escape 1:1 Chamois offers edge-free cushioning designed to deliver the maximum in comfort and support. Silicone grippers are featured at the cuffs and reflective elements have also been added for low-light visibility.